Two explosions rocked a pro-Kurdish rally in the southeastern Turkish city of Diyarbakir on Friday, killing at least two people and wounding over 100, according to the country's officials. The two fatalities were police officers. Diyarbakir hospitals confirmed receiving more than 100 injured, and sent out a call for urgent blood donations, Reuters reports. "It is not yet clear whether this was an attack or an accident. Whatever caused it, we will find out," Prime Minister Ahmet Davutoglu said about the explosion, while addressing supporters in the city of Gaziantep. In a written statement President Tayyip Erdogan called the blasts a “provocation” aimed at undermining peace. He also expressed his condolences to the victims’ families and said state authorities were conducting an investigation into the incident. Initial reports said there was only one explosion, and blamed it on an electricity fault, which was later dismissed by Turkey's energy minister. The blasts came just two days before Turkey holds a parliamentary election, and hit a gathering organized by the pro-Kurdish People's Democratic Party (HDP). The party is now on the verge of gaining 10 percent of the vote. Should it get that much support, it would become the first party with Kurdish links to get into parliament. 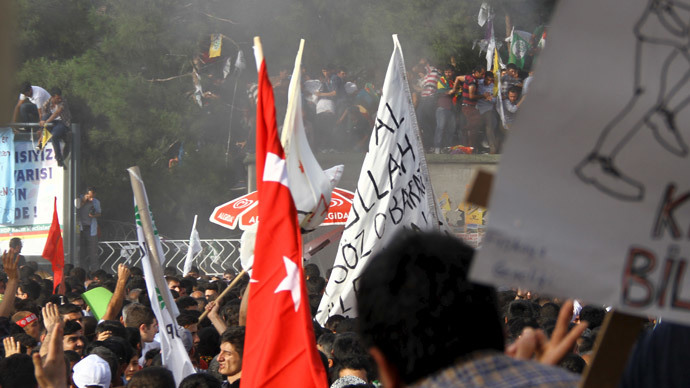 Tensions have flared during HDP's campaign before. Party officials say there have been over 70 attacks over the course of the campaign. On Thursday, nationalists clashed with the party's supporters in the town of Erzurum, prompting increased security at future gatherings. HDP is relatively new to Turkish politics. It was founded in 2012 as a political wing of a union of several left-wing groups. Those include proponents of women and gay rights, secularists, anti-capitalists and environmentalists of Gezi Park protest renown. Erdogan has accused the HDP of being a front for the Kurdistan Workers' Party (PKK), which took up arms in 1984 in an insurgency that killed 40,000 people. Peace talks between Ankara and jailed PKK leader Abdullah Ocalan started more than two years ago.